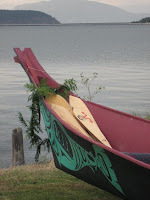 I recently took part in the 2008 Paddle to Cowichan, BC, the destination for this year's Tribal Journeys event that takes place each summer in which Tribes from around the Puget Sound and Canada paddle traditional canoes to a host tribe. 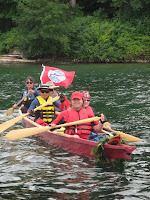 I was invited by Dannny Marshall, Tribal Leader of the Steilacoom Tribe to be part of their canoe family along with the Carver Camp Canoe Family headed by Phil Red Eagle. 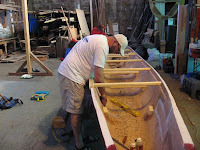 The group had just finished carving a hunting canoe called "Flicker" and were getting ready to take her on her first voyage. I've been volunteering with the Steilacoom Tribe for a couple years now, helping with the website and a ethnobotanical garden. 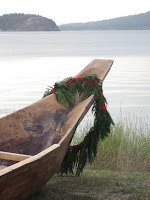 Having grown up in Steilacoom, WA it's been great fun and very rewarding to help out since the Steilacoom are not a recognized tribe so have no state or federal funding sources. So it was a big surprise and great honor to be asked to help paddle. I met many wonderful people along the journey, took many pictures, and have many wonderful memories. 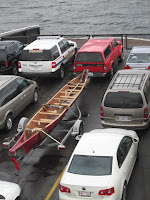 One of groups that impressed me greatly was the Pink Paddle Canoe Family. They not only paddled many miles with the other 100 or so canoes on the journey, they did it to raise awareness for breast cancer and to honor the many people who have survived or have been lost to cancer of any type. One of the first statements in our SSF vision is "seven generations" which honors the wisdom of native peoples to act today in ways that respect and benefit those who come seven generations after us. So the opportunity to participate in the 2008 Tribal Journey was very meaningful for me personally and for SSF. I am very humbled to have been part of the journey, to paddle alongside the Pink Paddlers, as well as the many other Tribes that took part in this year's journey. Image above: me helping carve "Flicker"